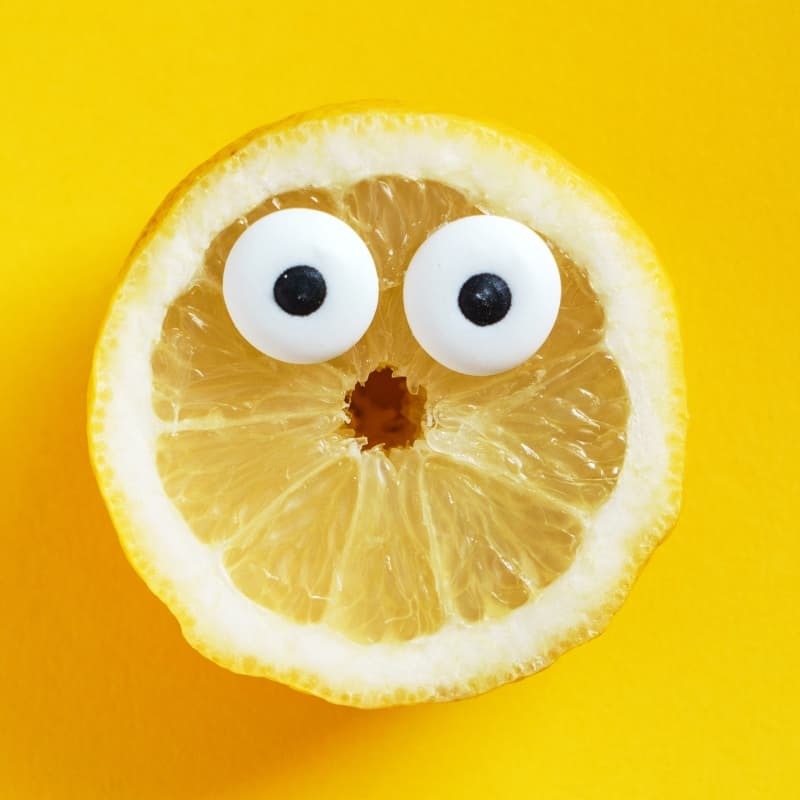 When I started the Low FODMAP Diet, my first week did not go well. While my diet was free of FODMAPs, it was also somewhat free of food. I spent my first few days living on rice, “safe” vegetables, and plain meat dishes. It was bland, it was boring, and it was not enough. My dietitian suggested I add quinoa to my diet. I gave it a try and it made a huge difference. This little seed packs 8 g of protein and will fill you up in record time. There are also a ton of fun ways to use quinoa. 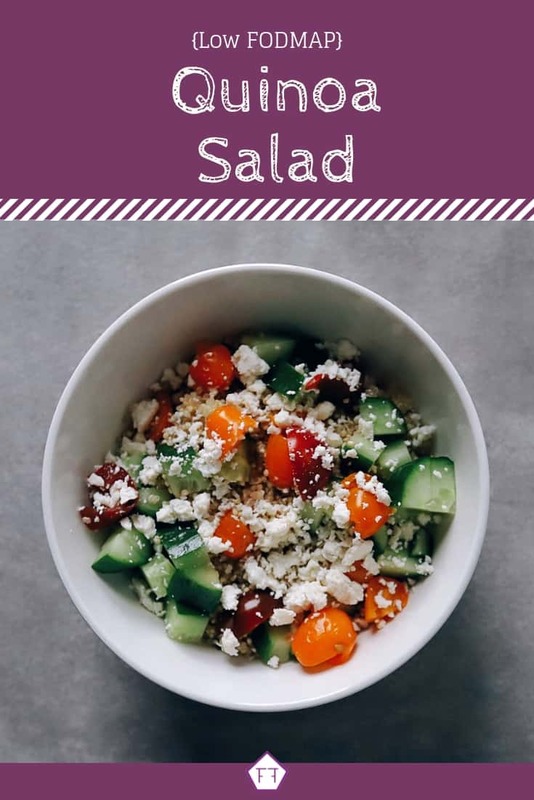 One of my favourites is this low FODMAP quinoa salad. 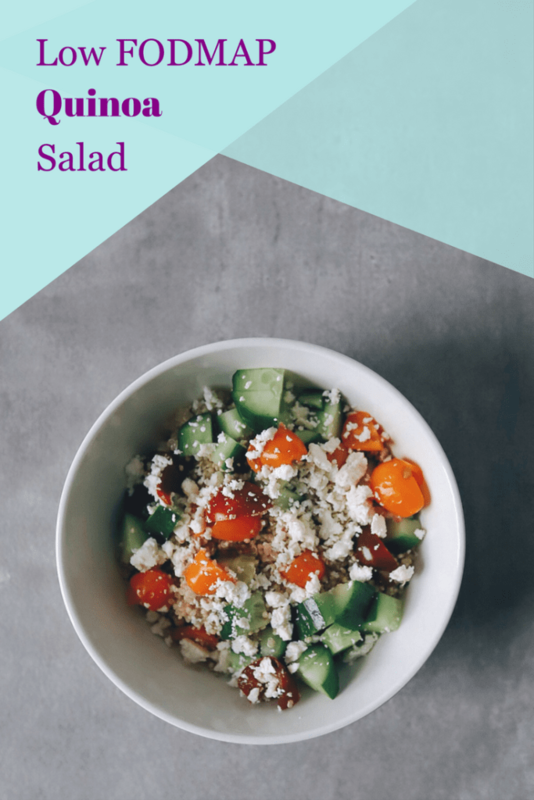 This quinoa salad makes an awesome lunch on the go or when I have back to back meetings. If I know have a busy week coming up, I’ll make a few containers and stick them in my fridge for a quick and healthy meal. Think this low FODMAP quinoa salad sounds great, but you don’t have time to try it now? You can PIN THIS POST for later. 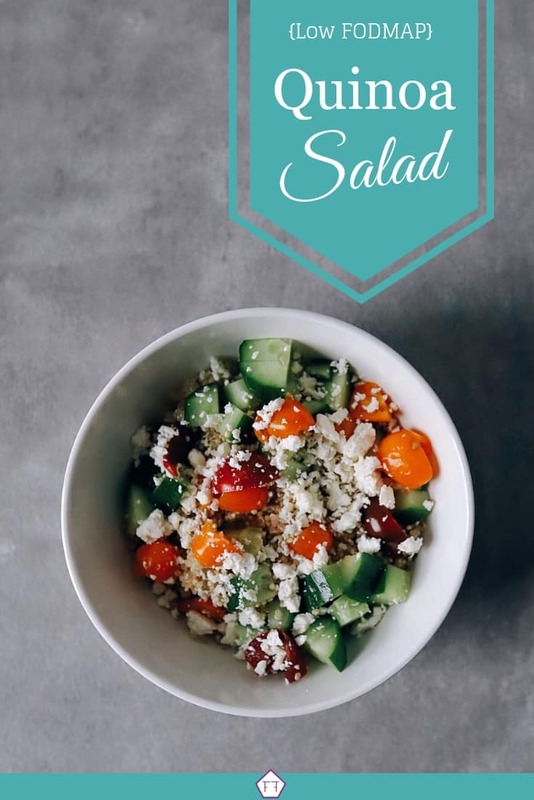 This low FODMAP quinoa salad will fill you up and keep you focused throughout the day. Check out the notes below for tips on keeping this recipe FODMAP friendly. We’ll start with the star of the show. According to Monash University, quinoa is safe in servings of 1 cup per sitting. Monash doesn’t mention a maximum serving, but, quinoa has a lot of fiber. So, I normally stick to the recommended portion size just to be safe. This recipe also uses cucumbers and tomatoes. The Monash app says cucumbers don’t have any FODMAPs. 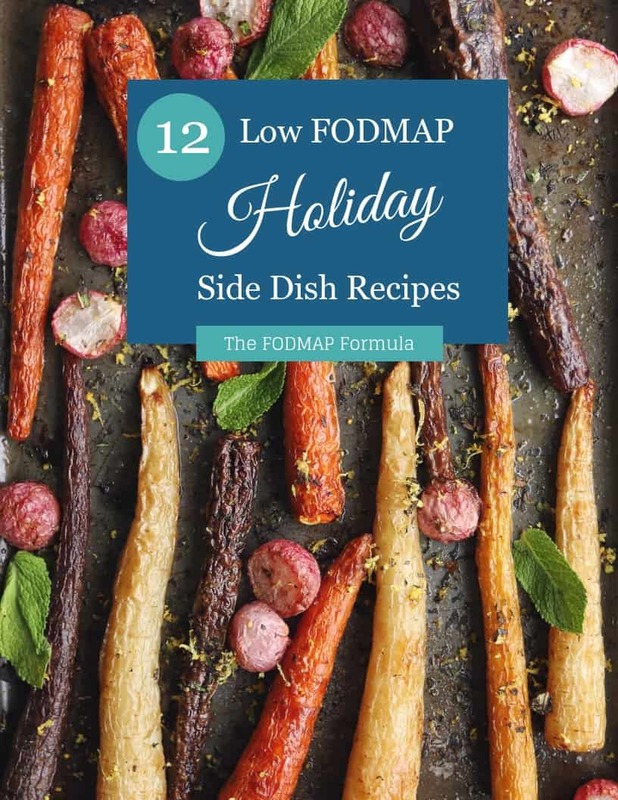 So, you can eat as many as you want without adding to your FODMAP load. The serving size of tomatoes depends on the kind of tomato you use. According to Monash, common tomatoes don’t have any FODMAPs. This means you can add as many as you want to your quinoa salad. Roma tomatoes, on the other hand, are high FODMAP fructans in servings of 5.5 tomatoes or more. I can’t imagine how you would fit that many tomatoes in a single serving of this dish, so you should be ok here too. Diced tomatoes can make the quinoa soggy if they sit too long. So, I like cherry tomatoes because I can pop them in whole. According to the Monash app, cherry tomatoes are low FODMAP in servings of 4 cherries. Servings of 13 cherries or more are high in Fructans, so make sure you count them. Our final ingredient is feta cheese. Monash recommends 1/2 a cup of feta cheese per sitting. This recipe uses 2 tbsp, which is well within the recommended serving size. Even though I normally eat this low FODMAP quinoa salad for lunch, it’s technically a side dish. We normally pair this side with chicken or fish. But, it will work with almost any meal where you would serve rice. 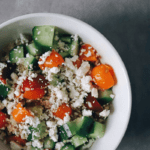 Want to try this low FODMAP quinoa salad? Don’t forget to PIN THIS RECIPE for later. Quinoa is a star in this quick and easy quinoa salad. Use it as a side dish, lunch, or a healthy and filling snack. Cook your quinoa as per the instructions and place in your serving dish. Add remaining ingredients and mix well. This recipe is delicious when served warm! 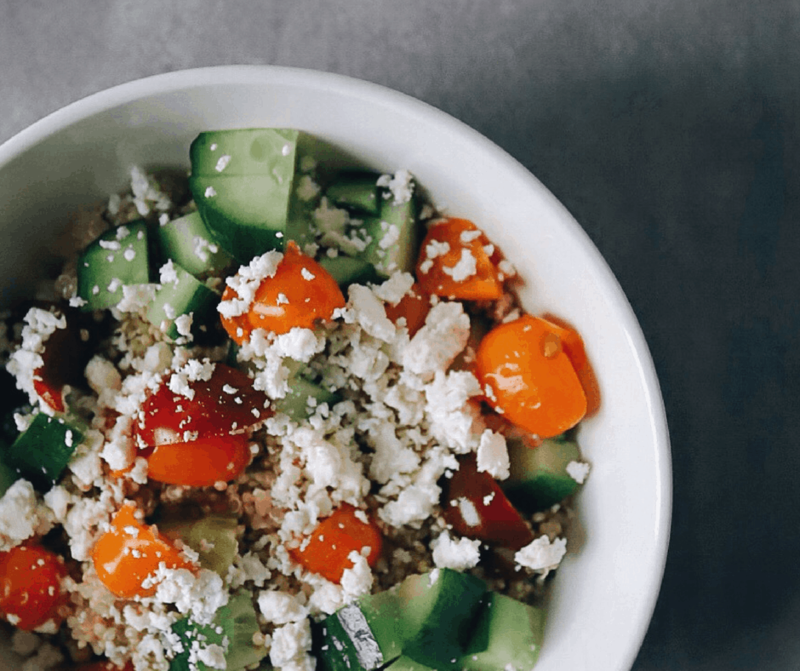 Hopefully, this low FODMAP quinoa salad helps keep you filled up. If you like this recipe, sign up for my mailing list below. You’ll get new recipes and articles delivered right to your inbox. 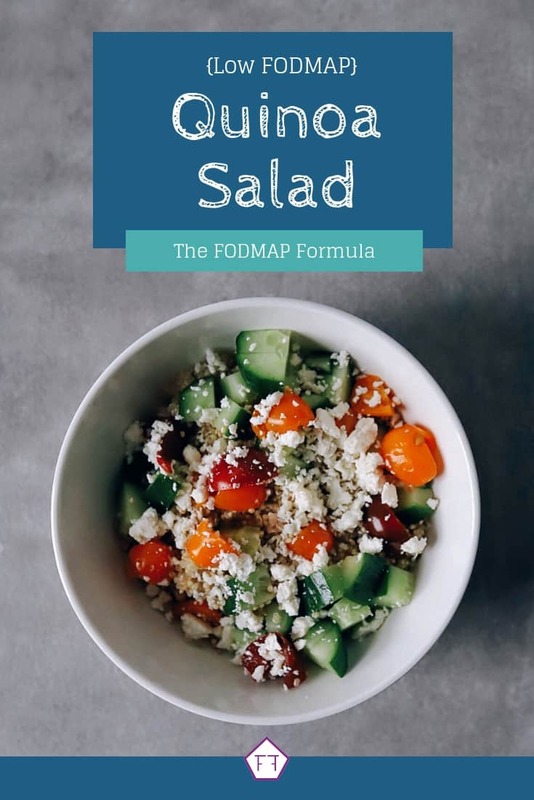 Curious about what else is happening in The FODMAP Formula kitchen? Follow me on Instagram for bonus recipes and a sneak peek at my latest projects. Together we’ll get the Low FODMAP Diet down to a science!